The CERFACS (research center dedicated to computational sciences; https://cerfacs.fr/en/), the PI of the PPM project, will conduct the ensemble LES and perform work on machine learning under uncertainty (see the following offer, https://cerfacs.fr/en/offer/cfd-simulations-for-industrial-risk-and-environmental-impact-assessment/). The project is funded by the aeronautic and space science foundation (STAE; http://www.fondation-stae.net/). Successful candidates will be contracted by the Institute of Technology Antoine de Saint Exupéry (IRT Saint Exupéry; http://www.irt-saintexupery.com/) based in Toulouse. 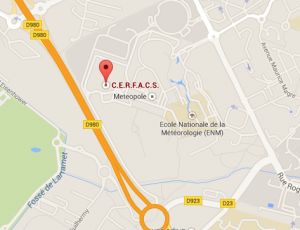 Place of work will be the French National Center for Research in Meteorology (CNRM; https://www.umr-cnrm.fr/) the research laboratory of the French weather service (Météo-France).